Designation for monorail rack railways for overcoming extreme inclines in rough terrain. The route consists of a square tube, on the underside of a rack is welded. The pipe is mounted on supports mounted at a distance of a few meters. This Monorackbahnen have a relatively low space consumption. You can get slopes of up to 100% Tilt overcome. Horizontal and vertical curves are possible up to a radius of four meters. Therefore, they can be flexibly and individually adapted to the topography. As vehicles so-called monorack tractors with diesel, petrol or electric drive are used. This can carry up to 250 kg of load. 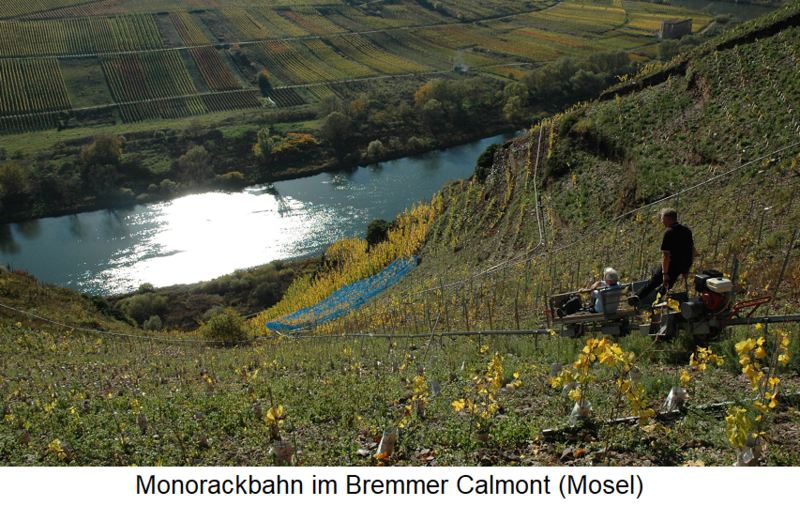 A main area of ​​application of Monorackbahnen is the Steillagenweinbau, where heavy loads are to be transported in a topographically difficult position. They serve as means of transport for piles, fertilizer and the grapes at the vintage or just as a climbing aid for the winemakers. A list of the wine regions concerned, such as the Moselle or in the Swiss Wallis is under steepest vineyard contain. This page was last modified at 27 October 2017 at 07:51.